Prevent wind-blown swaths- cut high and tuck swath edges into the stubble to limit wind loss. Swathing in the same direction as the most common winds (swath east-west when prevailing winds are from the west, for example) will reduce the risk. Straight combining might be the better option, especially in a thin or short crop that will not leave a lot of stubble to hold the swath. In windy conditions, a shatter-tolerant variety will not only reduce losses for standing crop but for swathed crop as well. Manage fields with variable maturity- even if all the topography seems to be showing up across your field this year (especially if you experienced drought and/or heat stress), with accelerated maturity on the hill tops and delayed maturity in the low spots, just focus on the stage that holds the majority of the yield. Decide where the majority of the yield will be coming from and plan your crop staging and related field operations around that portion of the field. In some cases, the most mature areas could be due to disease, so don’t time the swathing operation around plants that will not contribute much to yield. 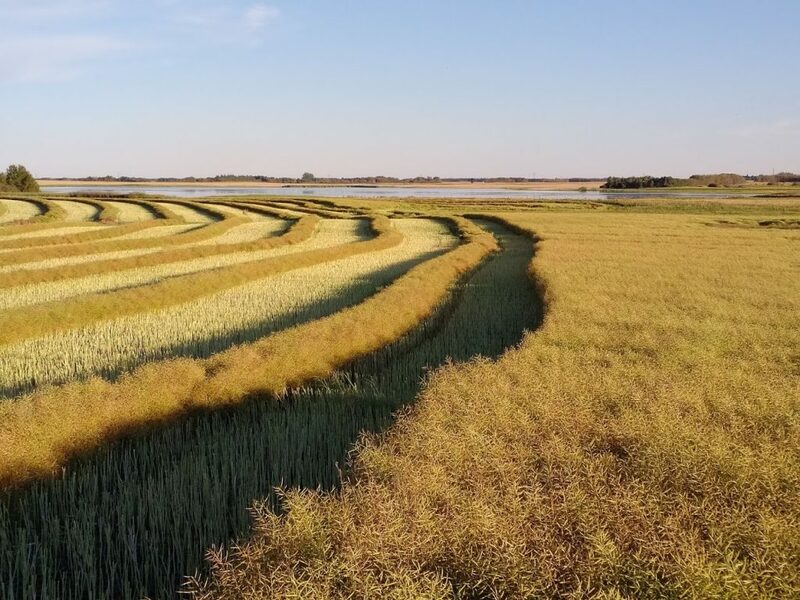 For the less mature areas, aim to delay swathing until they have at least a degree of colour change, so long as it doesn’t greatly compromise the plants in the majority of the field. Read more. Dealing with hail- Hail can cause plants to put out new branches, creating a mix of mature pods ready to shell out and brand new pods just starting to fill. The key is to decide where most of the yield will come from and cut based on seed colour change for those branches — with a consideration for calendar date and frost risk. A pre-harvest herbicide could help with straight combining if the highest-yielding parts of the crop are ready to go. In that situation, the pre-harvest will dry down the green parts for easier harvest. If the highest yielding parts of the plant are the latest parts, spraying now will sacrifice all that yield. Read more.